Are Vinegar, Baking Soda, and Borax Safe to Use in HE Washers? One of the biggest selling points of a high efficiency (HE) washer is its lower carbon footprint impact on the environment. All front load washers and high efficiency top load washers use much less water than a standard washer with a center agitator. So, if this earth-friendly feature appeals to you, it makes sense that you would want to use natural products like distilled white vinegar, baking soda, and borax as well. Can Natural Products be Used in HE Washers? 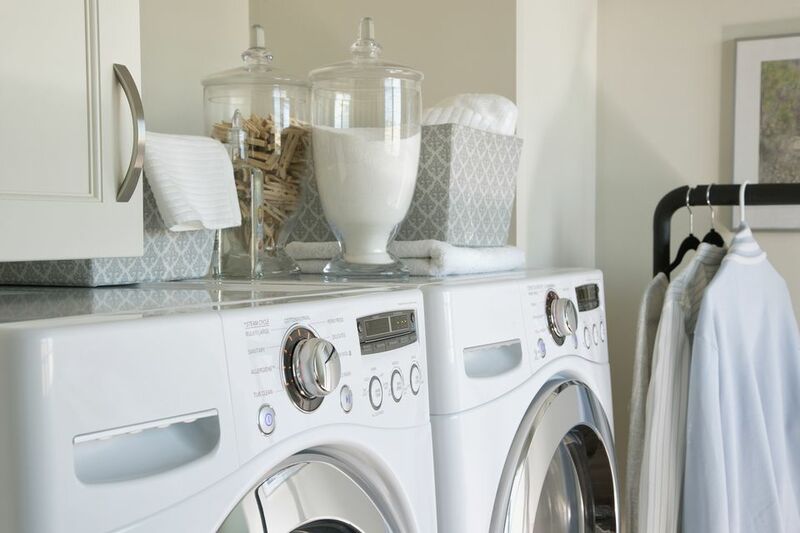 While high-efficiency (HE) washers do require the use of non-sudsing HE detergent formulas due to lower water levels used in each cycle, the "old-fashioned" detergent boosters like baking soda and borax can still be used in the machines. Detergent boosters help whiten whites, remove stains, and act as a water softener. Baking Soda: Since baking soda is dry, it should not be placed in the automatic detergent dispenser with your regular detergent because it can cause clumping and clog the dispenser. Instead, sprinkle 1/2 cup baking soda into the empty washer tub before you load the clothes. Baking soda acts as a natural brightener and deodorizer. If you have particularly smelly clothes, using a full cup of baking soda will not harm your washer. You'll get better results if you allow the clothes to soak in the baking soda and water for at least 30 minutes before completing the wash cycle. Borax: Treat borax the same way as dry baking soda. Sprinkle 1/2 cup borax into the empty washer tub before adding the dirty laundry. Be sure there are no lumps in the borax powder that may not dissolve if you are using cold water. Borax works as a water softener and deodorizer. Can I Use White Distilled Vinegar in HE Washers during the Rinse Cycle? If you dislike commercial fabric softeners, white distilled vinegar can be used instead to help soften the clothes. The white distilled vinegar should be placed in the fabric softener dispenser so it will be added during the rinse cycle. Fill the fabric softener cup to the top level with the white vinegar. The vinegar helps remove any detergent and soil that is clinging to fabric clothes feeling soft and clean. There will be no vinegar odor clinging to the fabric. An added benefit of using white distilled vinegar is that your washer will be left much fresher and cleaner than if you use a commercial fabric softener. Fabric softener residue traps bacteria and encourages the growth of mold and mildew and causes odor in front load washers. I Have Tough Laundry Odors. Can I Use Ammonia in a High Efficiency Washer? Some smelly clothes like those of hog farmers, skunk encounters, or even some cat urine stains require the use of strong ammonia to remove the odors. It is safe to use NON-SUDSING household ammonia in HE washers. Take extra care to read the label and make sure that there will be no excessive suds. The ammonia can be added directly to the washer drum before loading the dirty clothes and adding water. NEVER MIX CHLORINE BLEACH AND AMMONIA. Combining the two creates TOXIC FUMES that are deadly. What About Bluing? How Do I Use Bluing in a Front Load Washer? Bluing helps trick the eye to make white clothes look brighter and whiter. This natural product has been used for centuries and it still works today. If you have a top load HE washer, mix the bluing as directed on the packaging with at least one quart water and add to the wash cycle. For use in a front load washer, always dilute the bluing with water. Mix 1/4 teaspoon with one quart of cool water in a glass container (it will stain plastic). If the dispensing drawers on your HE washer remain unlocked during the cycle, add through the dispenser directly into the wash cycle after it has already filled with water. If the drawers on your front load washer lock as the cycle starts, dilute the bluing as directed on the bottle and then put as much diluted bluing as will fit into the largest available drawer, usually the bleach dispenser. NEVER mix bluing and chlorine bleach in the same load. If any bluing solution remains in the dispenser drawer after the cycle, clean the dispenser thoroughly. How Does a Front Load Washer Work With so Little Water and Detergent? Do I Need a Steam Feature on My New Washing Machine?